Talks are apparently complete, the details thrashed out and the contract drawn up. The only thing missing? Lewis Hamilton's signature. At the end of March, Hamilton said the formalities of a new deal at Mercedes would be "done this week". Since then? Barely a peep. Cue the Hamilton to Ferrari move rumour mill going into overdrive. Could it really happen? BBC Sport looks at five reasons why Hamilton might join the Prancing Horse. Juan Manuel Fangio, Niki Lauda and Michael Schumacher. Some of the most famous names in Formula 1 have all raced for one of the sport's most iconic teams. The only team on the grid whose roots can be traced right back to the beginning of F1 in 1950, it is of little surprise that most drivers aspire to one day race for Ferrari. "At the moment I can't see myself anywhere else because I'm really happy where I am," he said in 2013. "So anyone who gets that chance, no matter where you are or what car you drive, you look at a Ferrari and think, 'that's pretty cool'. But, like I said, at the moment I'm really happy where I am and I hope Mercedes keep me for even longer." If someone has been flirted with for many years, eventually they might just give into temptation. That could well be the case with Hamilton and Ferrari, with the Italian team having reportedly cast admiring glances the Briton's way in the past. According to the Mirror, Hamilton was twice targeted in 2014, and rumours first started circulating that he could one day be a Ferrari driver even as far back as 2007 - his debut season in the sport. For Hamilton, there is the sense that he always believes he can achieve more. He won one world title, and wanted another. He's won two, now wants three. 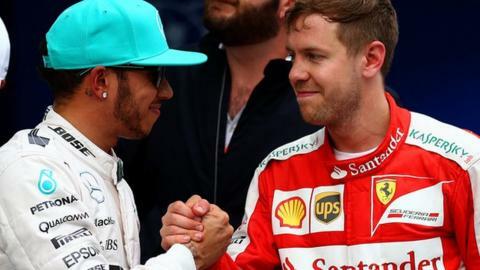 His superb record since entering Formula 1 has already ensured his place in history but moving to Ferrari and winning with them would give him the chance to achieve something only one other driver has managed in the history of the sport - winning three world titles with three different teams. Only the legendary Fangio can boast a better record, winning five world titles with four different teams. There is potentially a seat available at Ferrari for next season, with Kimi Raikkonen's future at the team uncertain. The former world champion rejoined the Scuderia in 2014 and, although his contract expires at the end of this season, the Finn says Ferrari do have the option to extend that into 2016. Neither Raikkonen or Ferrari are giving much indication that that will happen, though, with team principal Maurizio Arrivabene saying: "If you ask me now, 'does he deserve to renew the option?' I am going to say yes. But if I am going to say yes, I don't want the driver to fall asleep. I want to keep him awake. "Kimi is at his best when he is in a bit in trouble. This is a psychological approach. So the paper [the contract] at the moment is white. Sometimes I have to take the pen, then take it back." Hamilton is one of just 499 owners of the limited edition supercar "LaFerrari"
Still not convinced? Then how about this. In March this year, Hamilton celebrated winning the opening race of the season in Australia by treating himself to... a Ferrari. According to CNN, he splashed out $1.5m on a "LaFerrari" - a limited edition hybrid supercar capable of going from 0-127mph in just seven seconds. "For us there is no problem," Mercedes boss Toto Wolff is reported to have told Italy's Corriere Della Sera about Hamilton's purchase. There might be no problem at the moment, but they'll probably prefer that he doesn't get too comfortable in a red car.